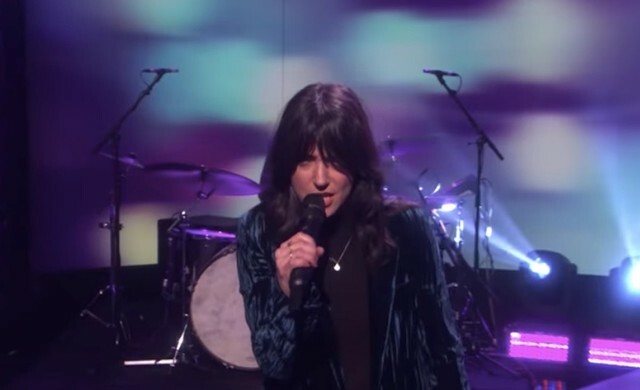 Sharon Van Etten was the guest on today’s episode of The Ellen DeGeneres Show, where she performed the Remind Me Tomorrow’s single “Seventeen.” Van Etten does her best to adapt the moody, hazy track for Ellen’s afternoon audience and mostly succeeds. The nighttime mood lighting of the stage was a big help in matching the vibe of the record. Van Etten’s latest album Remind Me Tomorrow came out last month. The project is her first full-length since 2014’s Are We There. Along with “Seventeen,” Remind Me Tomorrow features “Comeback Kid” and “Jupiter 4.” She’s scheduled to appear in the second season of the Netflix show, The OA, later next month, and she also recently recorded a cover of James Cleveland Moore’s “Never Grow Old” for the documentary The Gospel of Eureka. Van Etten also just launched a tour of North America and Europe behind Remind Me Tomorrow earlier this month that wraps in April. Watch the Ellen performance below.